Part of the allure of Mickey’s Starland would be the namesake stars. While the land modeled much of itself after Duckberg from DuckTales, there were a whole host of characters from The Disney Afternoon to pull from in order to gain the attention of children visiting the Magic Kingdom in the early 1990s. When Mickey’s Birthdayland transformed into Mickey’s Starland in the spring of 1990, it brought along with it Mickey’s Magical TV World. 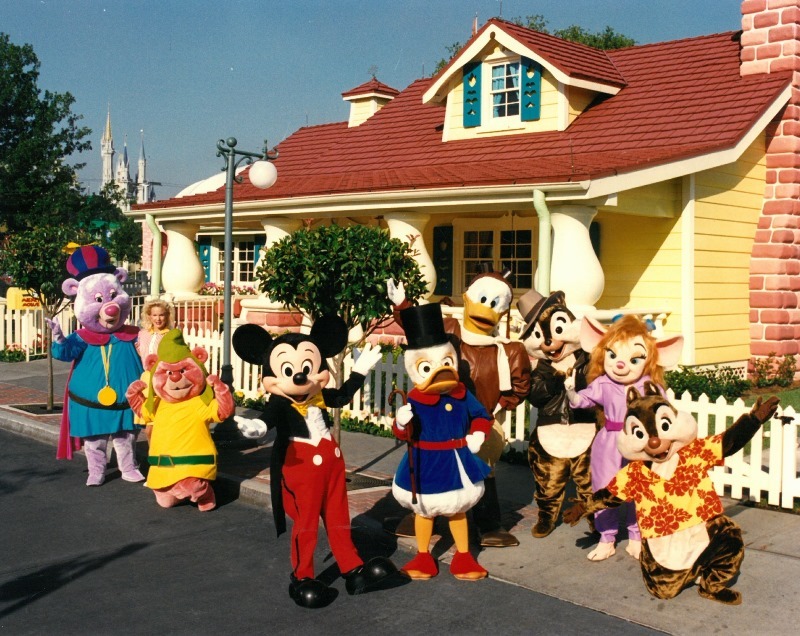 The show was host by C.J., seen at far left with the Gummi Bears, who oversaw the stage production that include characters from the entire line-up of The Disney Afternoon. 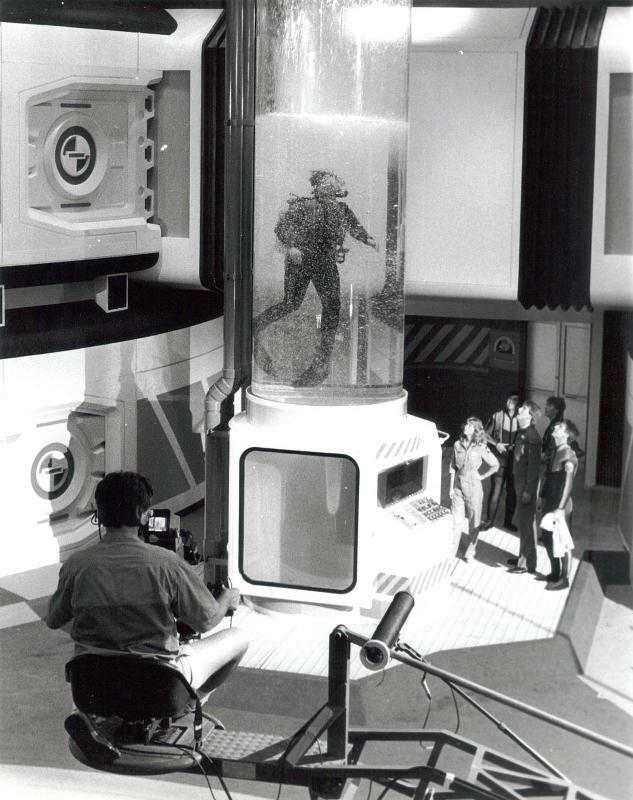 The stage included sets from the various shows, such as the tree from Disney’s Adventures of the Gummi Bears or Scrooge McDuck’s vault. The first iteration included not only DuckTales and Gummi Bear characters, but also Chip ‘n’ Dale Rescue Ranger cast members, pictured here, and friends from TaleSpin. Mickey was also present to assist with co-hosting the whole affair with C.J. The show would change each year with shifts to The Disney Afternoon’s line-up, with additions such as Darkwing Duck joining the show. As the years went by, the show also became a surprise for Mickey, and C.J.’s co-host became the rapping computer known as D.U.D.E. Looking back at the show know, it is clearly a time capsule of its day, and one that would probably cause a fair amount of headshakes amongst adults who know they were kids screaming in that audience. Regardless of the show itself, how many of us wouldn’t leap at the chance to revisit some of these characters in the park today! 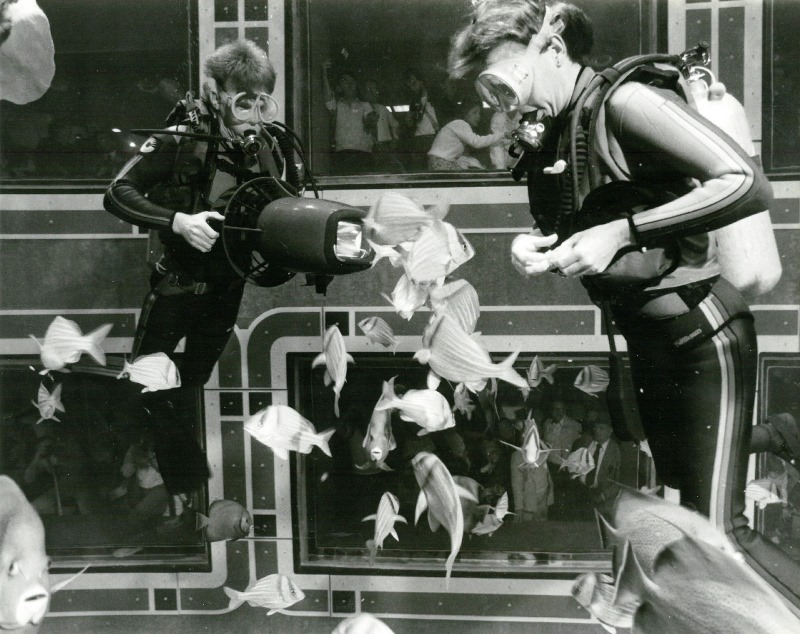 There are other interesting tidbits to explore in this photograph as well. Let’s start with the most obvious, Mickey’s house. This is not the squashed and pulled animated house that many of us remember from Mickey’s Toontown Fair, but instead a version of the house that had a few outlandish architectural features, but that otherwise could have lived on any street in the country. Similarly, if you look just behind the tree to the left of Zummi Gummi, you can see Mickey Mouse’s mailbox. This mailbox, while seemingly normal, was out of place once the land transformed into Mickey’s Toontown Fair, so it was shelved, literally. 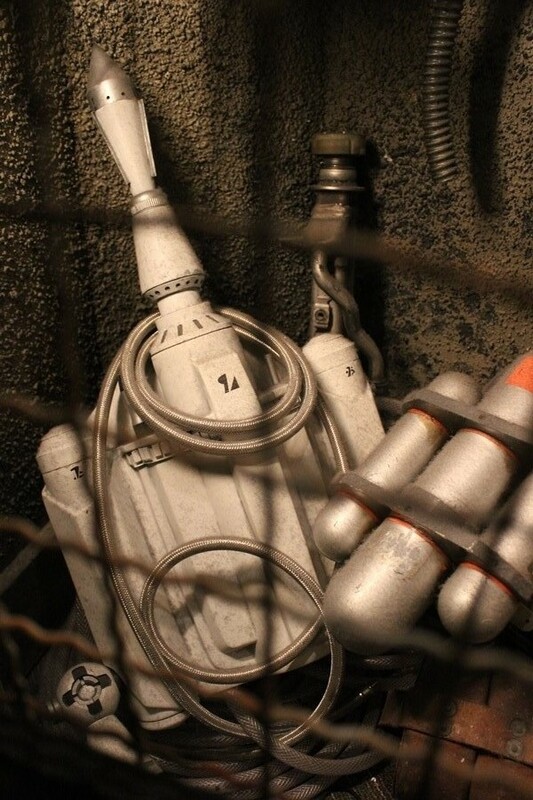 It could always be found tucked away on a shelf in Mickey’s garage. Last, but by no means least, if you look just about the roofline on the left, right in front of Cinderella Castle, you can one of the posts and the lines of the Skyway between Fantasyland and Tomorrowland. While there are no gondolas running in the photo, my guess is that this picture was taken early in the morning before the attraction was operating, as the Skyway would remain in operation until the end of the decade. 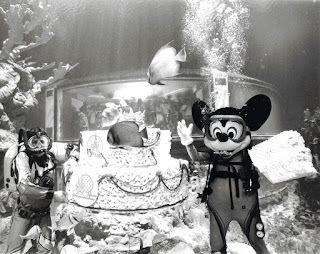 With all of the history of Walt Disney World, it’s easy to forget how much worth and information can be contained within a single photograph. Now if you’ll excuse me, I have to find some crimes that are slipping through the cracks. 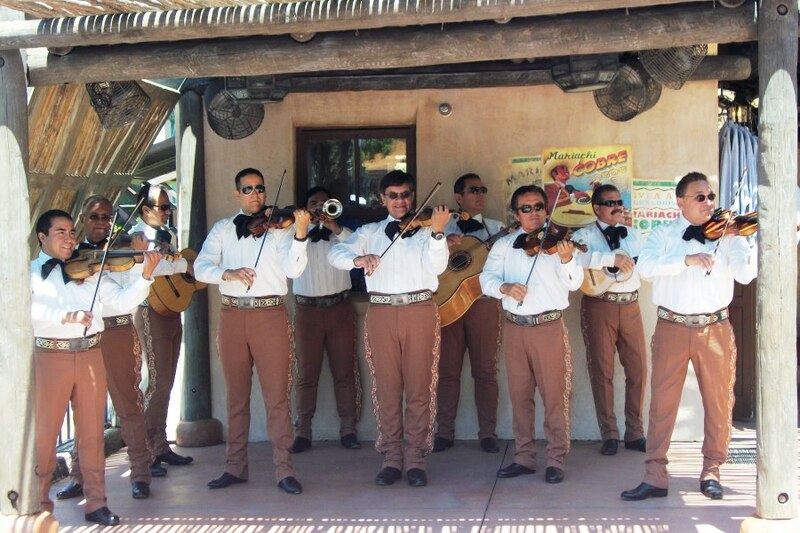 There is a lot to like about the offerings from La Hacienda de San Angel, aside from the fact that it sits on the water overlooking World Showcase Lagoon and has spectacular viewing for IllumiNations. Speaking strictly on the menu there are a multitude of small bites and entrees that are sure to satisfy if you’re craving something from Mexico. Today, however, I want to make a case for saving some room until the end of your meal so that you can sample one of their incredible desserts. 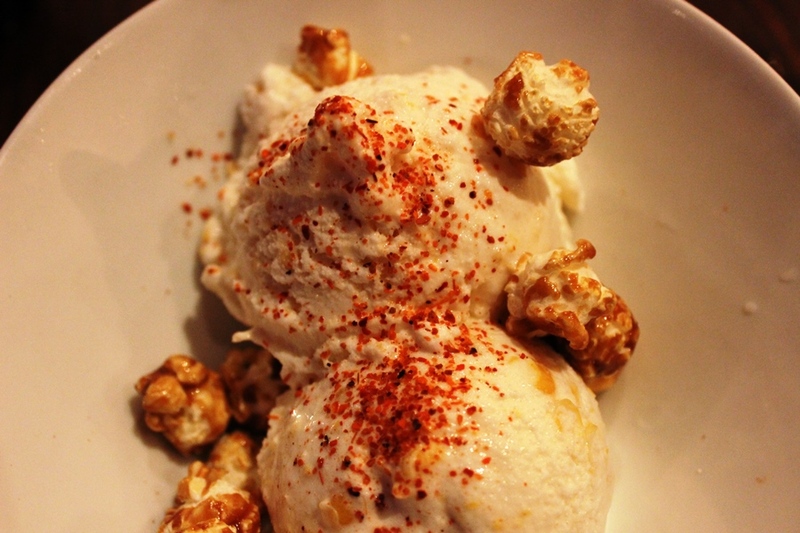 The Helado de Maiz, roughly translated to corn ice cream, is simply too good not to try. I know there are those of you out there right now thinking that as much as you like savory and sweet combos this might be too much for even you to enjoy, but I’m here to tell you that you’re flat out wrong. The menu listing is simple, “corn ice cream served with candied popcorn,” yet that doesn’t tell the whole story. The corn is actually sweet corn, which lends itself more handily to an ice cream. Aside from the candied popcorn, think top-tier Cracker-Jack type popcorn, there is also a tangy chile seasoning that tops the ice cream. So, what do you end up with in your bowl? Two scoops of cream colored ice cream, complete with bits of sweet corn worked in, a healthy amount of candied popcorn, and the red chile seasoning that pops off of the ice cream, making the overall presentation simple, yet gorgeous. As for the taste, it is mildly sweet, so this isn’t a sugar rush type of ice cream, which is a pleasant surprise and easy on the palate. The hint of the corn plays so well against the tangy and sour flavors of the chile seasoning. If you need that extra kick of sweetness, the candied popcorn has you covered, but it is also great for mixing up the creamy texture of the ice cream with something that has a bit of a crunch. The Helado de Maiz looks terrific and tastes even better. It’s not often that my favorite item on the menu isn’t an entree, or maybe a well-crafted cocktail, and I’m not sure if that’s not the case for La Hacienda de San Angel either. However, the Helado de Maiz makes a strong and competitive case for being my favorite dish on the menu. Even if it doesn’t turn out to be your go-to menu item, I implore you to make sure you have room at the end of your meal to give this dessert a try. There are wonderful details throughout Walt Disney World, little nuggets that tie into Disney’s history in film, animation, and theme parks. Few areas, however, may be as rich in these types of details as Frontierland. And perhaps the one spot with an embarrassment of riches, when it comes to story driven details, is Big Thunder Mountain. 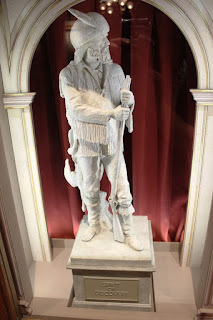 Since it’s refurbishment in 2012 that added in more of the mining story and the history of Barnabus T. Bullion, there have been layer after layer to uncover about the second Magic Kingdom mountain. This poster entices those seeking to travel west to do so with the Butterfly Stage Line. It is a gorgeous example of posters that would entice travelers with daring calls and reasonable fares. 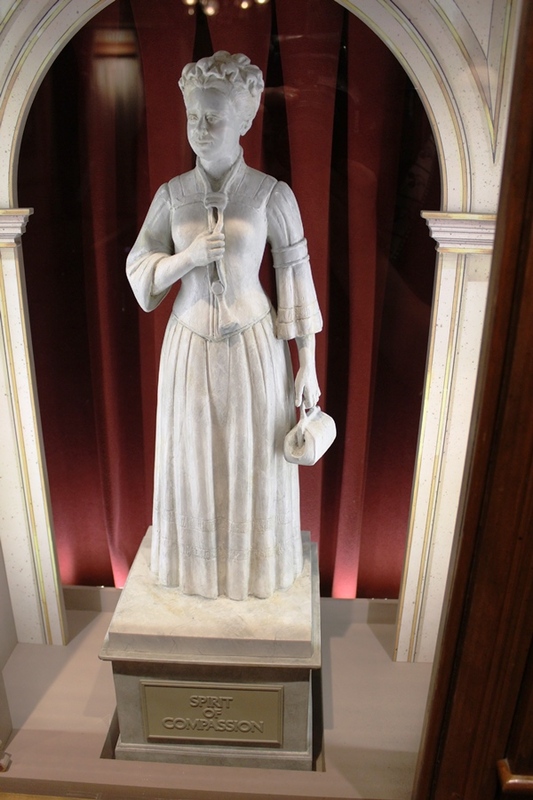 Of course, the more stops a stagecoach could make, and the quicker they could make the trip, the more passengers could utilize the line for travel. 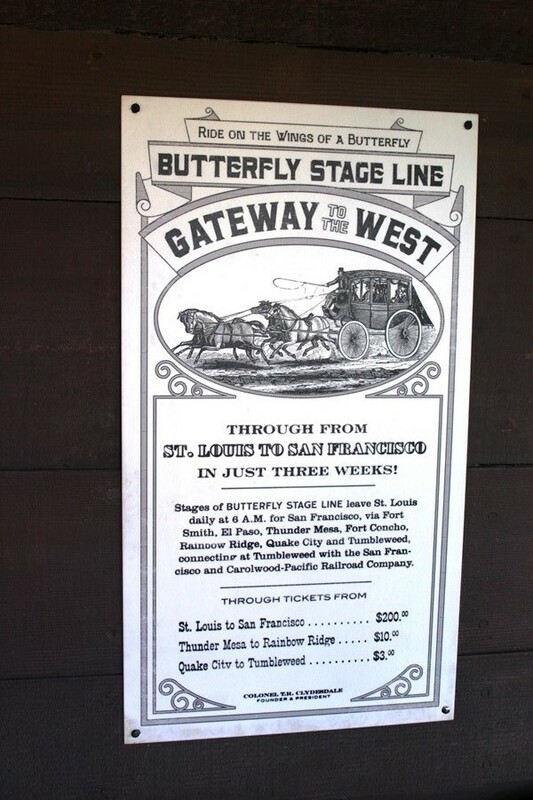 In this case, the Butterfly Stage Line guarantees passage between St. Louis and San Francisco in just a matter of three weeks, not a bad deal in those early Frontierland days. For me, however, the real attention grabber is the stops the line will make along the way. This section reads: Stages of BUTTERFLY STAGE LINE leave St. Louis daily at 6 A.M. for San Francisco, via Fort Smith, El Paso, Thunder Mesa, Fort Concho, Rainbow Ridge, Quake City, and Tumbleweed, connecting at Tumbleweed with the San Francisco and Carolwood-Pacific Railroad Company. The above listing bookends the journey with several real life locations. 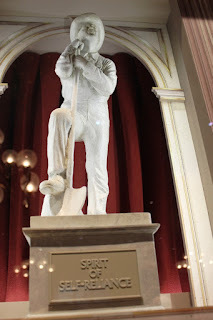 St. Louis, Fort Smith, El Paso, and San Francisco are all places that really exist and could be visited, most of which are not intricately tied to Disney lore. The remaining stops are where things get a little interesting. The good portion of the Butterfly Stage Line’s destinations has a tie to the Apple Dumpling Gang. This shouldn’t be too surprising, considering the bottom of the poster tells us that the line’s founder and president is Colonel T. R. Clydesdale, Dusty’s father from the original Apple Dumpling Gang film. This film just happens to take place in Quake City, the first to last stop along the stagecoach’s route. Moving on to The Apple Dumpling Gang Rides Again, we find a film that opens with Amos and Theodore arriving in one of our other destinations, Fort Concho. 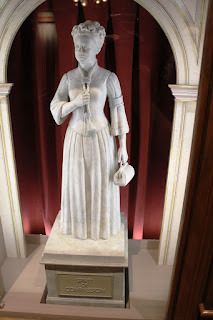 While Fort Concho is a real location with a fascinating history, it is the fact that was a setting utilized by the Apple Dumpling Gang that lands it on the route. Jumping back a ways, we see Thunder Mesa, and this is where we’ll begin our adventure into Frontierlands from around the globe. Thunder Mesa is the clapboard and sagebrush setting for Disneyland Paris’ Frontierland. The town was a boomtown just like all of the fabled Frontierlands, with the Ravenswood family being the top billing in a town that prided itself on its availability of gold, silver, and copper. 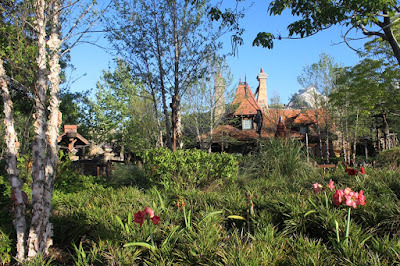 Moving further along, we find a stopover in Rainbow Ridge, the original Frontierland. 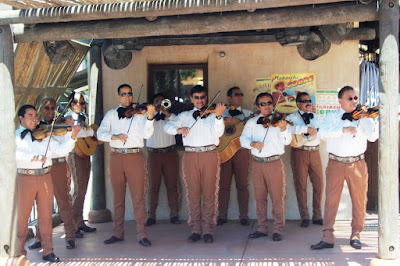 The name Rainbow Ridge dates back to the earliest days of Disney theme parks, when it was part of Disneyland’s 1956 attraction Rainbow Caverns Mine Train. While the mining town known as Rainbow Ridge has undergone many facelifts and relocations over the years, it can still be found alongside Big Thunder Mountain Railroad in the original park. The end of the Butterfly Stage Line route leaves us in Tumbleweed, the home of Big Thunder Mountain in the Magic Kingdom, and coincidentally where we find ourselves examining this poster. This is where the line meets up with the railroad. Listing the Carolwood-Pacific isn’t as subtle a nod as it used to be, but it is still a worthy name in Disney canon. The Carolwood-Pacific was Walt Disney’s backyard scale railroad, it is the name given these days to anything that showcases Walt’s love of the railroad. 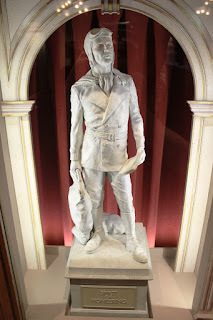 It is mentioned as part of the Walt Disney World Railroad at multiple stops, and more of its history can be uncovered in both One Man’s Dream over at Disney’s Hollywood Studios and at the Wilderness Lodge. No matter where you get on or jump off of the Butterfly Stage Line, there are stories abound to discover that run between parks, film, and even some of Walt Disney’s own life. The only question is, how far will you be moseying on down the line? The Main Street Electrical Parade returns to Disneyland later this week, but every memory of the parade comes from its presence in the Magic Kingdom. 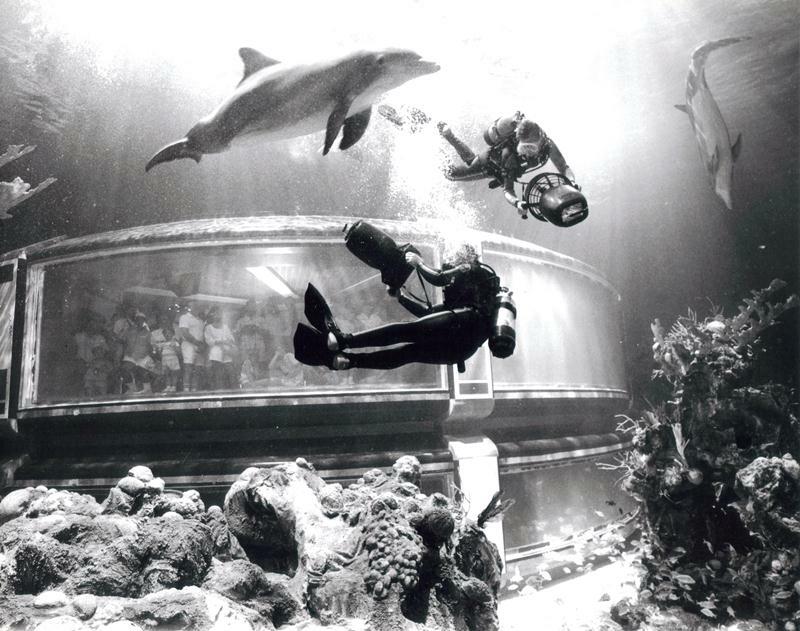 It has a place in both parks as some of their best, and most nostalgic, nighttime entertainment. It was the first parade I saw as a child, or the first parade I can recall seeing at the very least, and I have many memories of it tied to my family and friends, my father and wife in particular. It is my sincerest hope that everyone who catches the Main Street Electrical Parade during its run at Disneyland makes memories that are just as special as my own. 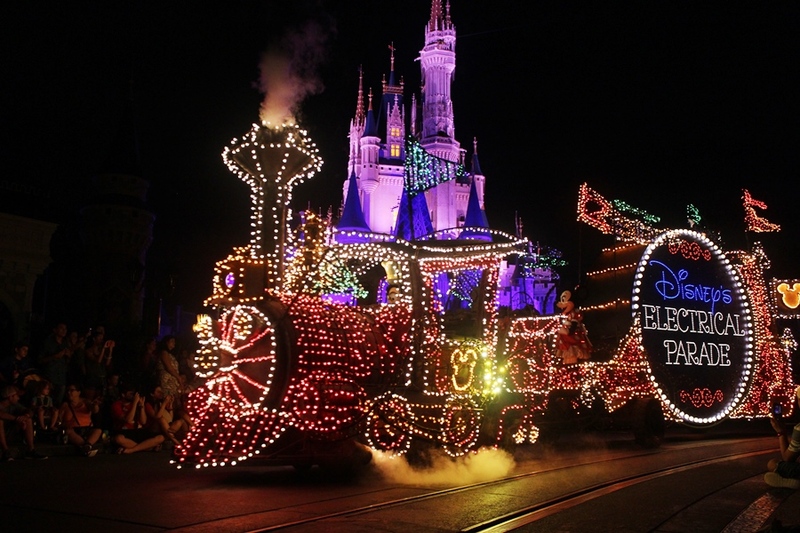 However, what is the current plan for the Magic Kingdom’s nighttime procession? The announcement of the Main Street Electrical Parade’s impending October 2016 removal came in early August of last year. Since then, the news has been light and whispery on what will be replacing the nighttime staple. We were told fairly quickly that this was not a swap and that the Paint the Night parade was not going to be making its way to Walt Disney World anytime soon. Aside from that, nothing has been hinted at. Perhaps there is a method to the madness. For starters, there were the holidays of Halloween and Christmas to consider. While neither Mickey’s Not-So-Scary Halloween Parade or Mickey’s Very Merry Christmas Parade were daily occurrences during the fall and winter, their namesake parties ran enough nights that I can forgive the Magic Kingdom for not rushing something out immediately. Similarly, would any entertainment endeavor, no matter how insanely well-orchestrated and executed, want to be the follow up to the Main Street Electrical Parade? I can only imagine how some fanatics would accept nothing less than the Electrical Parade’s return as a suitable replacement or option. Placing some period of time between the parades allows for enthusiasts to accept that one attraction has left and begin anticipating the arrival of something new, without the gnashing of teeth that could potentially sink an immediate follow-up. Lastly, and perhaps most importantly, we need to look at entertainment ventures from the last year to see where Disney may be taking a pause. Rivers of Light, the much-publicized malignancy and delay-ridden nighttime show destined for Disney’s Animal Kingdom, was slated to open last April. Media were alerted to its upcoming opening and guests planned trips around the opening of the spectacular, and then it was pushed back repeatedly and a place holder, The Jungle Book: Alive With Magic, was hurriedly inserted in its place. It would be easy to say that comparing Rivers of Light to any nighttime parade is like comparing apples to oranges, considering their different venues and the history Disney has with nighttime parades. 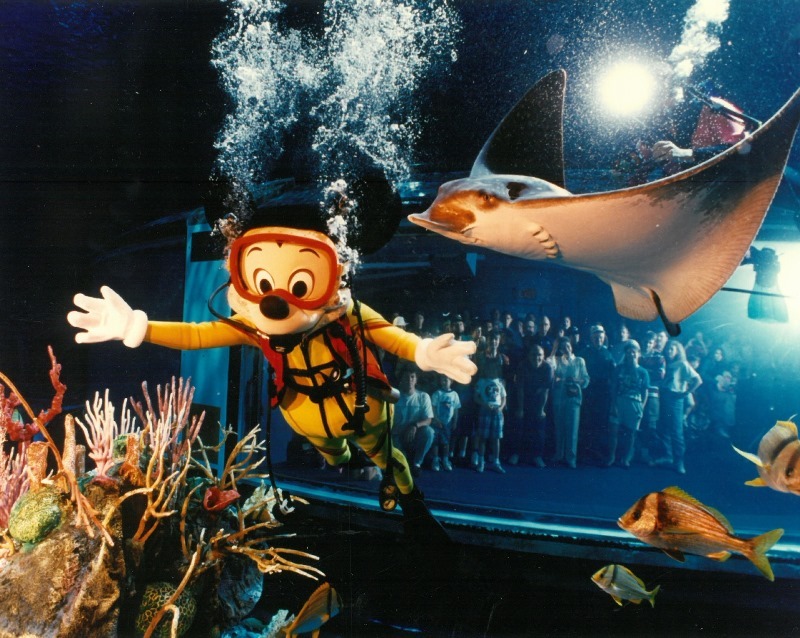 However, Disney has just as sterling a record with nighttime water spectaculars, from Fantasmic! to World of Color. 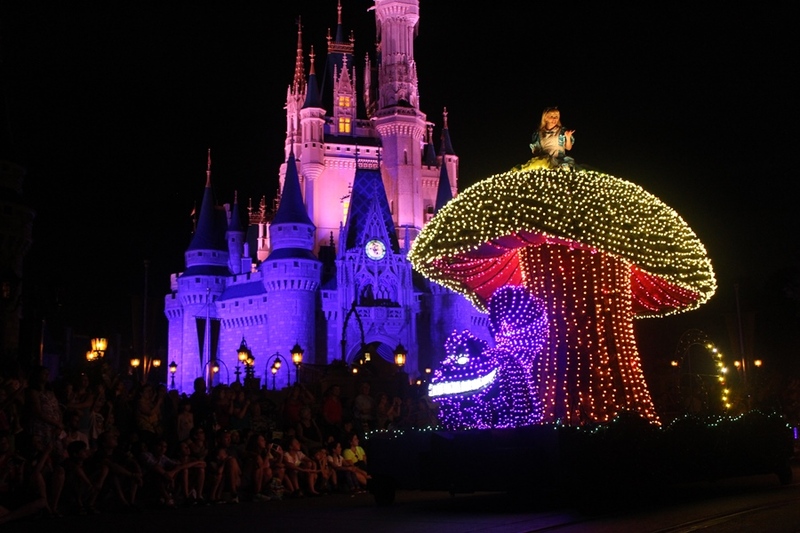 With all of this to consider, is it any wonder that Disney may wish to keep plans for a new nighttime parade under wraps until they are absolutely certain that they can send that parade down Main Street, U.S.A. without a snag? We are five months on from the announcement that the Main Street Electrical Parade was leaving Walt Disney World, three months beyond its departure from the Magic Kingdom, and two weeks from the conclusion of the holiday season. There isn’t necessarily a down season for the parks and resorts any longer, but if there is one, we’re in it currently. With Spring Break right around the corner and families making decisions about spring and summer vacations, I believe it is time for Walt Disney World to let us know what the next parade in the Magic Kingdom is going to look like. An announcement of this type, at this time, could indeed tip the scales for anyone considering a trip to Walt Disney World. Plus, it is definitely time to let dedicated enthusiasts know when and where their next dose of pageantry will arrive, and what it will look like once it arrives. The landscaping of Walt Disney World is as much a tool for storytelling as the architecture, signs, and Cast Members are. This attention to detail is one of the reasons that the Epcot International Flower and Garden Festival is one of the highlights of the year for me. Not only are there incredible displays to observe and learn from, but there is also a way to learn about the behind the scenes workings of Disney’s Horticulture. Let’s explore how the landscaping designs of a single park, Blizzard Beach, helps to give guests the sense that they have entered a winter wonderland on the meltdown. Just past Lottawatta Lodge is a gorgeous vista of the entire park, and it gives us a perfect place to talk about the entirety of Blizzard Beach’s flora and how it plays into the story of the water park. 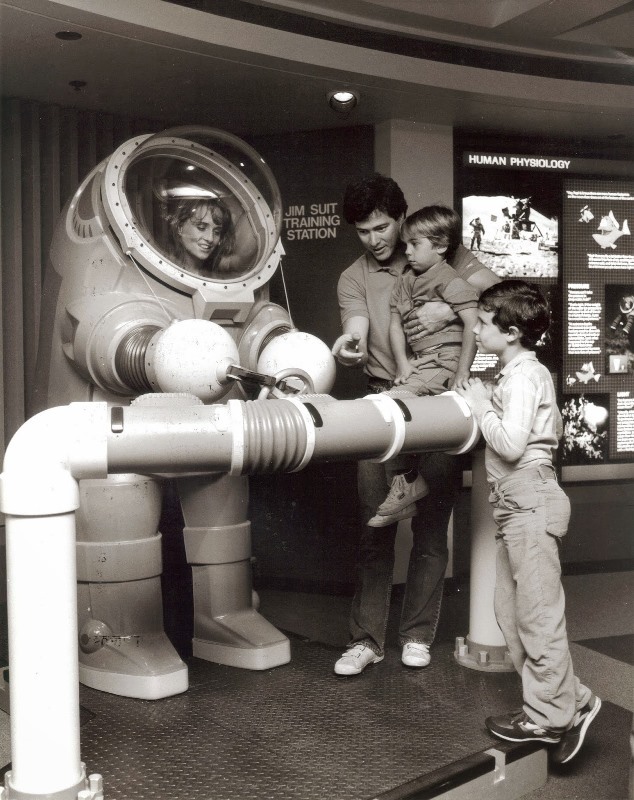 The story of Blizzard Beach is critical to the understanding of why certain plants were selected for the park and where they ended up. As the tale goes, Blizzard Beach was the vortex of a freak winter storm that turned the area into a skier’s paradise. Plans were made to turn the area into Florida’s first ski resort. The lodges were built, runs constructed, and even a chairlift was installed to take guests up the mountain. However, it was then that Florida’s naturally warm temperatures returned. It utter dismay, it was at this moment that Ice Gator took to the slopes and went careening down Mount Gushmore and through the resort. 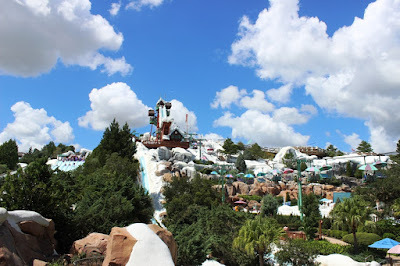 Inspired, the planners turned the ski park into a water park, and thus Blizzard Beach was born. In its wake it left behind some wildly paradoxical landscape. Let’s start with the top down, and that means venturing all the way up to the peak of Mount Gushmore. Up here, at the peak of a whopping 90 feet, Blizzard Beach creates an alpine setting with the use of evergreen and conifer species. Trees such as Spruce pine, Deodar cedar, and Southern red cedar all add to the northern feel at the top of the mountain. While guests may not notice these winter hardy trees while slipping and sliding down Summit Plummet, if you take a leisurely stroll/hike up Mount Gushmore’s stairs they rest majestically along the ledges along the mountainside. Meanwhile, down at the base of the mountain the tropical foliage native to Florida’s tropical climate returns to the park. This section of Blizzard Beach is home to Meltaway Bay, Tike’s Peak, and Ski Patrol Training Camp. Here the story is encapsulated in the Mexican fan palms, sago palms, Hong Kong orchids, scrambled egg trees, Crinum lilies, Selloum, and Allamanda. The mix and matching approach of these alpine and tropical plants depends on what section and altitude of the park you happen to find yourself in. There are two ways to see these two landscaping themes blend in with one another. The entrance to the park, including Sonny’s Sleds, Beach Haus, First Aid, and Lottawatta Lodge, features wonderful interplay between the winter and summer designs of the park. Secondly, and my favorite way to tour through the foliage, is to grab a tube and float around on Cross Country Creek. The woody ornamentals and perennials are on full display for guests relishing Blizzard Beach’s version of the lazy river. Of course, there’s also a simpler way to see the blending of beach and ski resort plant life throughout the park. 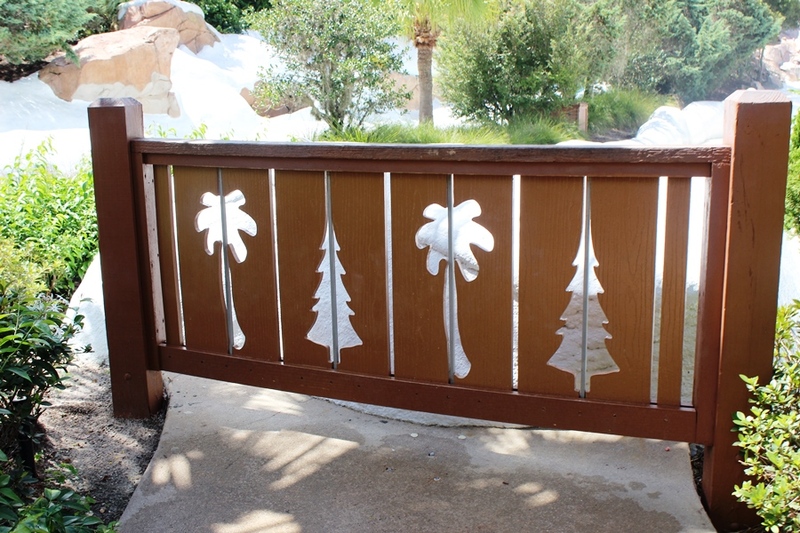 Just watch the cutouts present in the fencing throughout Blizzard Beach’s walkways. No matter how you choose to take in the wonderful work of Disney’s Horticulture around Mount Gushmore and all of its slippery slopes, it will always be there to help solidify the story of the park. Now, if you’ll excuse me, I think it’s time for me to put in at Manatee Landing! 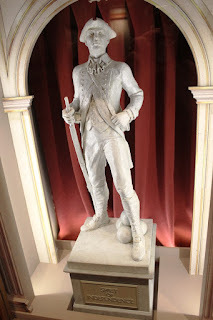 Inside Independence Hall, where The American Adventure takes place, guests are watched over by a dozen sentinels that each represent an ideal of spirit. 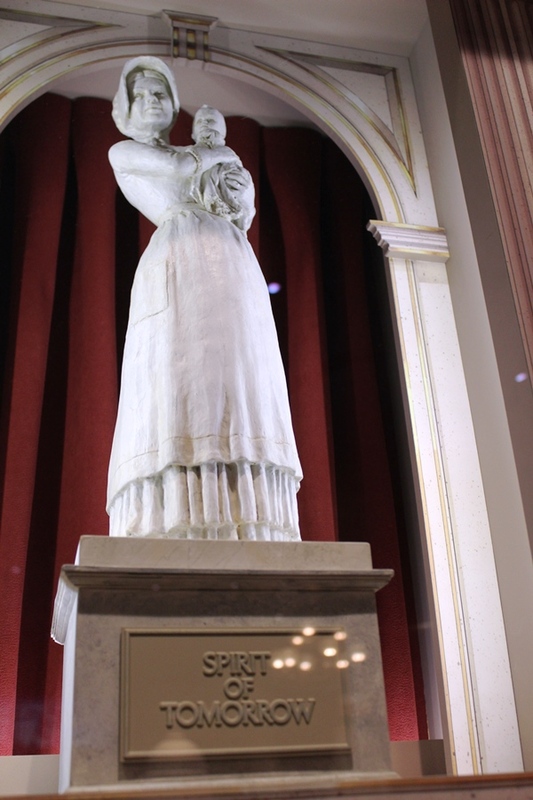 Collectively, they are the Spirits of America and give a fairly accurate representation of the American dream. Outside of The American Adventure, guests can see bronze miniatures of six of the spirits alongside busts of both mark Twain and Benjamin Franklin. There is another full set of the Spirits of America, but we have to leave Walt Disney World and head across the county to Disneyland in order to see them. In the waiting area for The Disneyland Story presenting Great Moments with Mr. Lincoln, a full complement of the Spirits of America can also be marveled at. While not a large and grand as their Epcot counterparts, they are roughly the same size as the bronze versions that stand in the windows outside of The American Adventure. Each of the twelve figures depicts a different profession that is the embodiment of that spiritual from. 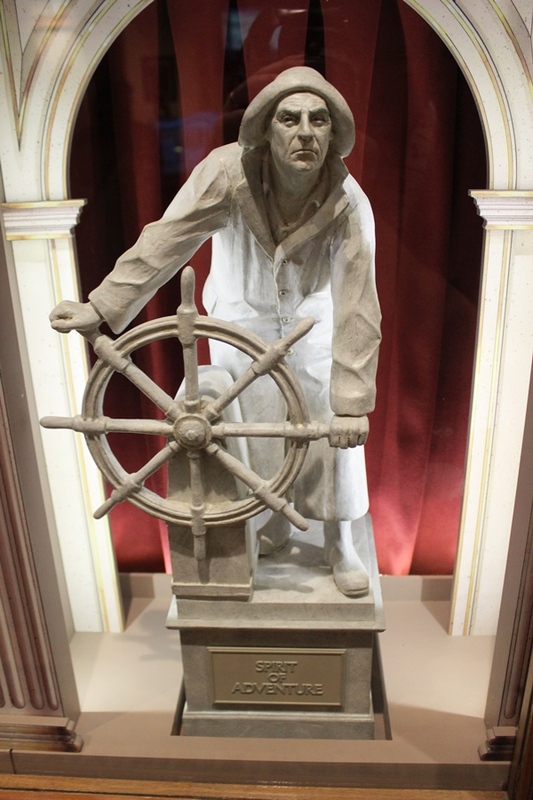 From the Spirit of Adventure being personified by a seaman at the wheel, to the Spirit of Innovation featuring a scientist or the Spirit of Tomorrow showcasing a mother and child, there is a bit of each of us to be found in these figures. 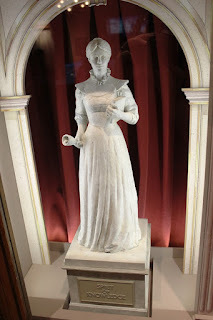 Let’s stop talking and take a tour through the individual figures from Disneyland. The holidays are over, which mean we can start talking turkey. I mean, talking turkey about duck. Let me get my foot out of my mouth so we can enjoy one of the signature dishes from Morimoto Asia. We’ve all heard about the ridiculously delicious ribs, but the menu is filled with mouthwatering bits of deliciousness, from the aforementioned Morimoto Spare Ribs straight on through to the dish with the common name, but uncommon flavors, Orange Chicken. We could spend an entire week talking about all of the various dishes from Morimoto Asia, and I promise there are more articles to come, but today let’s focus in on the Morimoto Peking Duck. 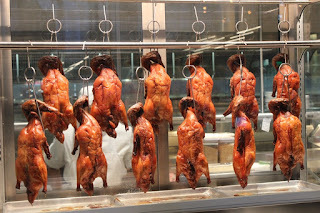 This review is going to be as much about the pictures of the Morimoto Peking Duck as it the words in the review, so take a moment to stop and admire the perfectly prepared ducks hanging in the window of Morimoto Asia’s kitchen. Seriously, have you ever seen something so beautiful? 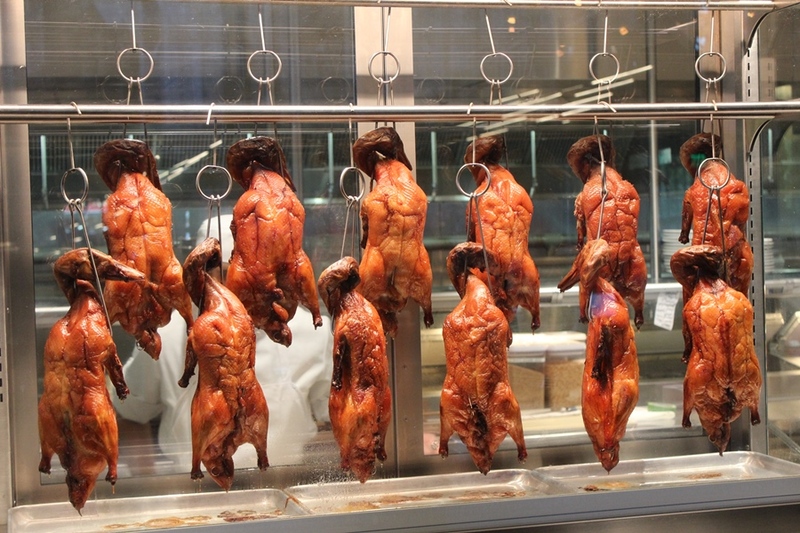 Morimoto Peking Duck is a whole duck that has been roasted in-house and then carved. The meal is recommended for two, but you do what you have to do, you hear me? Served alongside the dish are flour pancakes and two sauces, an apricot sweet chili sauce and a hoisin miso. Let’s go back up to that rack of ducks hanging in the window, this is an intricate part of the preparation process as the ducks, once they have been thoroughly cleaned has air pumped through them to separate the skin from the fat and meat, it is soaked in boiling water, and then hung up to dry, which is what we see above. While drying, the duck is further rinsed on the inside and a glaze is applied to the skin. After resting for approximately 24 hours, the duck is then roasted to a golden brown. Now, I’m going to stop here for a moment to be totally honest. I’ve never been a fan of duck. I’ve always found it to be oily and the meat tough to chew. I have clearly, even though I’ve been to some pretty swanky restaurants in my time, never had duck prepared appropriately. 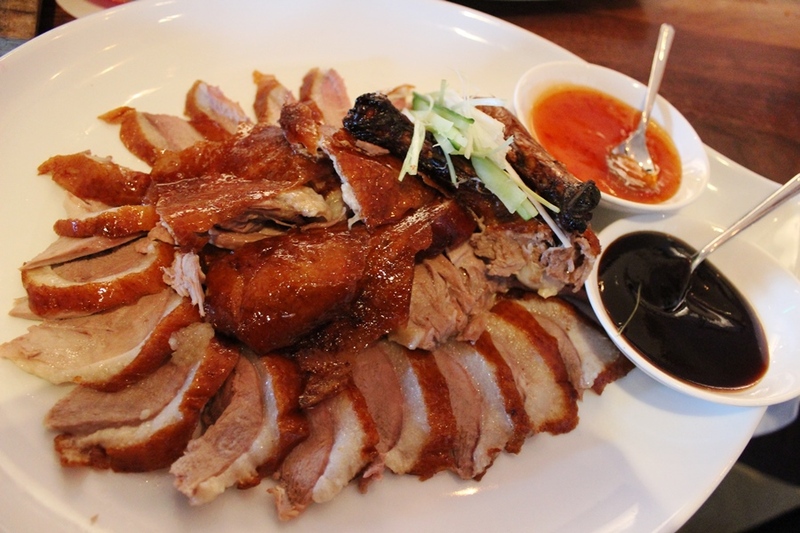 This dish has changed my mind about duck and has renewed my interest in other duck dishes in the future. Back to the duck at hand, the presentation of the dish is gorgeous. 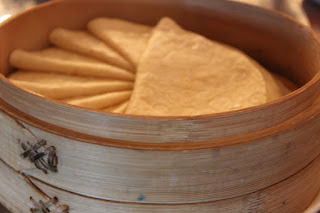 While it isn’t carved tableside, as can be common with Peking duck, the plate and bamboo dim sum container are enough to make your mouth water. As if I needed to prove my point, here are some more photographs. I did pause long enough before I dived in to sample the duck alone for strictly academic purposes. The meat is succulent and the thin layer of fat will melt in your mouth, but the real winner here is the skin. Crispy, salty, and a bit sweet, I’m not sure I’ve ever had a better skin from any sort of poultry as I did with the Morimoto Peking Duck. I’m not going to lie, I loaded up each pancake with as much duck as I could, a smear of both the apricot chili and hoisin miso sauces, some slices of green onion and kept on devouring the dish until there was no duck or pancakes left. I’m assuming the missus was also able to have some. In each pancake combo, you get perfectly steamed flour pancakes (think tortilla, not the breakfast staple), that wonderful duck, the bite of the green onions, and a harmonious balance of sweet, heat, tangy, and salty. I don’t have more to add, other than I am definitely looking forward to my next meal at Morimoto Asia, and trying to figure out how to try some of their other delicious dishes when all I want is more of this duck. In all seriousness, regardless of your feelings towards duck dishes as a whole, do yourself a favor and give the Morimoto Peking Duck a try. I would be shocked if you don’t love it! 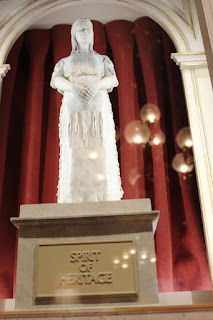 There are gods and goddesses throughout Polynesia that Disney has drawn inspiration for over the years for their attractions, resorts, and films. 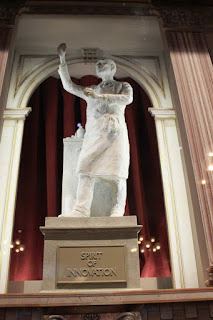 One deity, however, has been front and center at Walt Disney World for the past 18 years that is wholly a Disney creation. We don’t want to upset her, for obvious reasons, but we’re talking about the goddess of destruction, Uh-Oa. 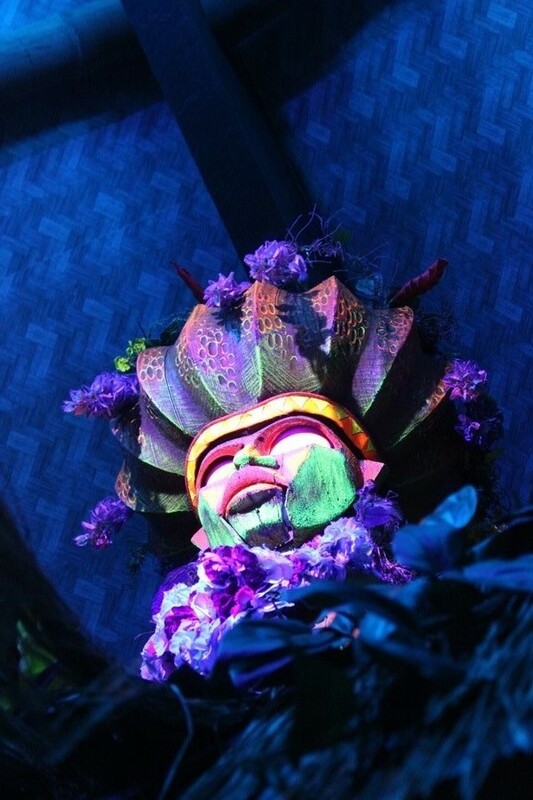 Once ordered by a brave imbiber in the Grog Grotto, Uh-Oa comes to life to offer a warning of her own that harkens back to her original home in Walt Disney World, The Enchanted Tiki Room – Under New Management. Aside from what the popular belief of what the second incarnation of Enchanted Tiki Room did to build up or tear down the attraction when it was unveiled in 1998, Uh-Oa was goddess who showed up to straighten out Iago after being summoned by the chant of “Uh-Oa, Uh-Oa, Uh-Oa-Oa-Oa.” Uh-Oa was voiced by Armelia McQueen, who children who grew up with the Disney Channel in the early 1990s will recognize as the Red Queen/Queen of Hearts from the live action series Adventures in Wonderland. Back in the Tiki Room, Uh-Oa arrives and through song dispatches the enterprising Iago before disappearing with a maniacal laugh. 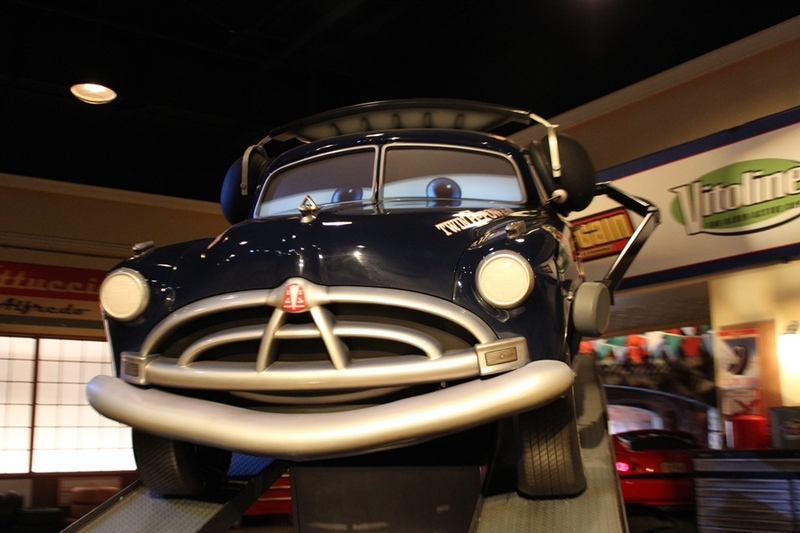 When the attraction was refurbished due to a fire in January 2011, it appeared that Uh-Oa had said ‘aloha’ for the last time. When the Grog Grotto opened its doors in 2015, the presence of the Uh-Oa audio-animatronics figure was a pleasant nod to the past. In reality, there is no historical or mythical figure of Uh-Oa. The Polynesian culture features ‘Oro (the god of war) and Pele (the goddess of volcanoes, fire, and destruction), but Uh-Oa is a strictly Disney creation. Of course, if you choose to partake in her namesake beverage all by yourself, you’ll definitely believe she is the goddess of disaster! Magic is critical to the ideal and mystique of Walt Disney World. 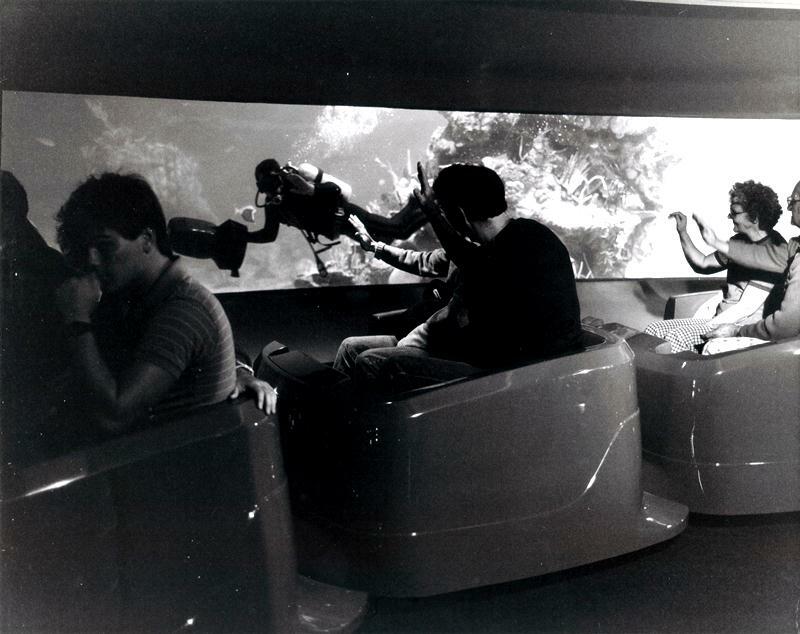 We, as guests, are always on the lookout for those magical moments, effects tied to attractions and shows we talk about as magical, and there are multiple terms thrown around the use the word within the parks; from the Magic Kingdom right on down to movie magic. What about magic in the most traditional sense? There is something to be said for a performance of the unexplainably happening right in front of us. Even better still is the ability to learn the secret for ourselves and amaze our family and friends. There have been multiple stores dedicated to the art of magic over the years. West Side in Downtown Disney was once home to Magic Masters, just as Fantasyland house Merlin’s Magic Shop. The most well-known and renowned of these venues, however, was Main Street, U.S.A.’s House of Magic. Whether it was the nostalgic idea of close-up magic that we all remember our uncle doing growing up, or being able to learn from a magician in the shop down the street, House of Magic was the ultimate destination for a sorcerer’s apprentice. 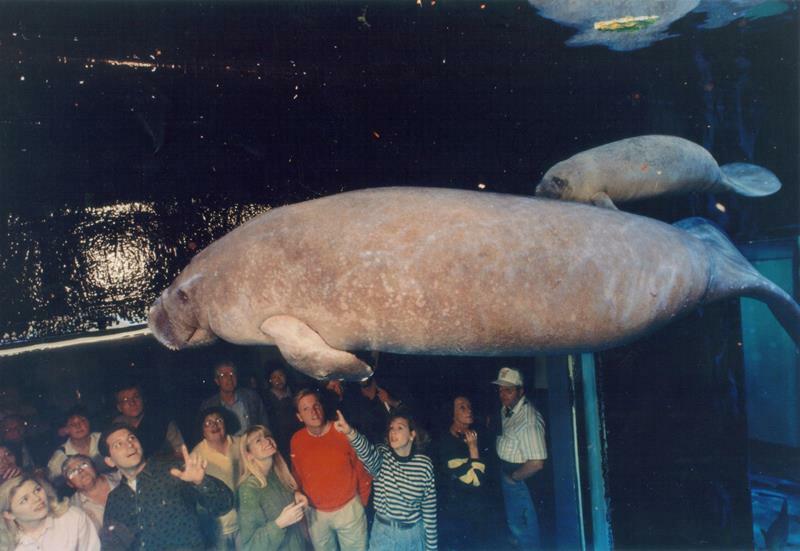 The House of Magic, an opening day to attraction, closed its doors in March of 1995. 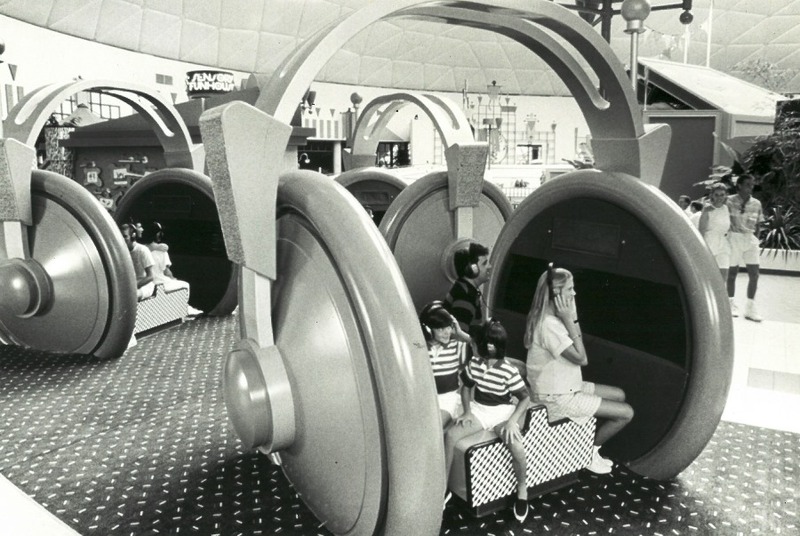 The space would be repurposed for as the Main Street Athletic Club before becoming part of the larger Emporium just a few years later. 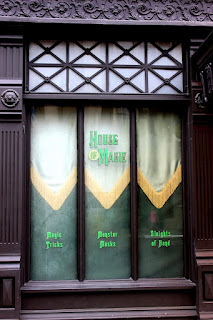 This wouldn’t be the end for the House of Magic, however, one of the more ornate façades along the Streets of America would be refurbished to include the moniker. While perpetually shuttered, the shop boasted Magic Tricks, Master Masks, and Sleights of Hand. The expansion coming to Disney’s Hollywood Studios of lands dedicated to Toy Story and Star Wars meant that the Streets of America would need to be replaces. 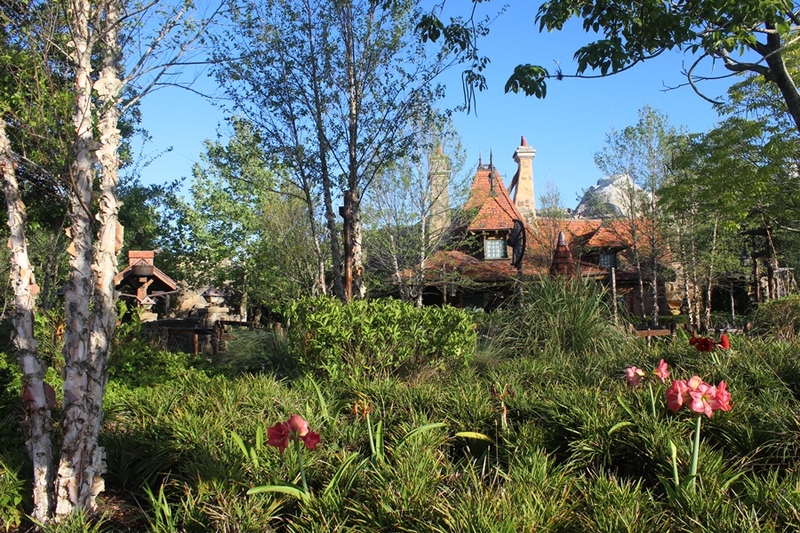 In early 2016 the entire area, including the reference to the House of Magic, was shuttered and demolition began. 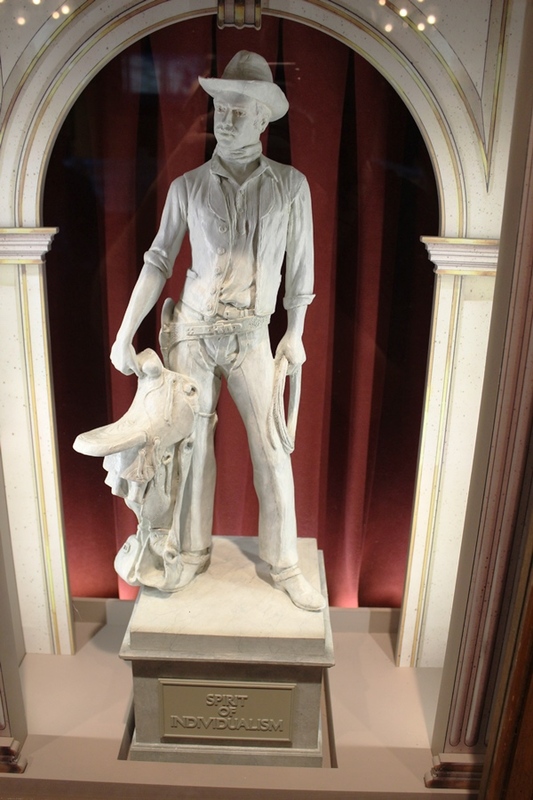 Magic still has a home in Walt Disney World. In fact, one could argue that the most fulfilling magical experience since the House of Magic closed has opened this past year. 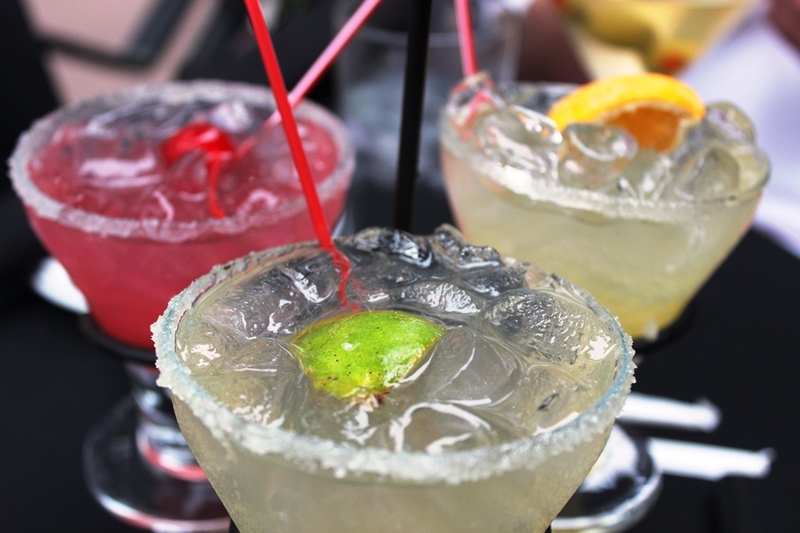 AbracaBar, situated along the BoardWalk, serves up drinks, some small bites, and a healthy dose of magic. The story contends that this was the spot for magicians to hang out, concoct magical cocktails and astound one another with their tricks, before they all vanished one fateful night. 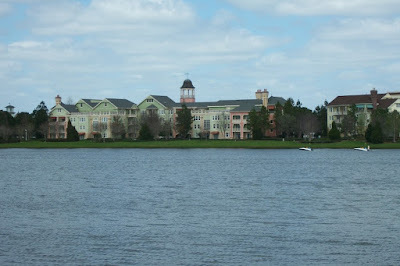 The BoardWalk makes perfect sense as a home for this establishment, not only in terms of the similar nostalgic feel that it has to Main Street, but also because magicians have regularly strolled the path along Crescent Lake entertaining and dumbfounding guests. AbracadaBar features posters of the bar’s most illustrious practitioners, as well as a collection of incredible artifacts. As intriguing as AbracadaBar is, however, it misses on two of the things that made the House of Magic so memorable to those of us who still pine to walk through its doorways. The ability to see and learn tricks from extraordinary prestidigitators and the collection of tricks, from the impressive right on down to snapping gum sticks. The ability to see and take home magic, however small, most certainly sent many of us on quests to learn more in our adolescent and adult lives. 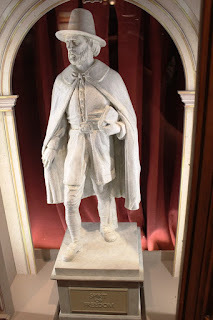 Perhaps a magic shop isn’t in the cards for Walt Disney World today, maybe it wouldn’t provide any sort of economic boost to the resort, but the celebrated House of Magic most certainly deserves a proper homage. I’m not sure where or what it would look like, but when you build a world around magic, you shouldn’t certainly give it a noteworthy home.